Your productions depend on sophisticated image production and high-performance cameras and switchers. 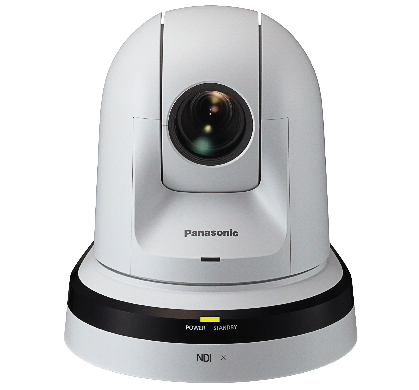 Leave nothing to chance by utilizing the broad line of Panasonic pan-tilt-zoom (PTZ) cameras and controllers. 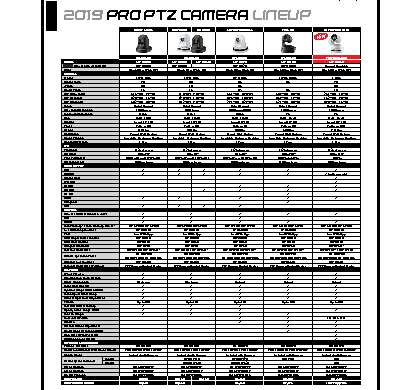 Our best-in-class family of award-winning professional PTZ cameras helps you capture your event — whatever the angle, location or lighting condition. Whether you choose the all-new performance powerhouse AW-UE150, powerful three-sensor AW-HE130/AW-HN130, the compact AW-HE40/AW-HN40, the innovative 4K AW-UE70/AW-UN70, the entry-level AW-HE38/AW-HN38 or the IP65 rated AW-HR140 you'll get flexible installation with PoE+, production quality H.264 streaming, IP-live remote management, and control, plus incredible video and remarkably smooth pan-tilt-zoom performance. The Panasonic family of PTZ cameras has an extensive feature set suited to meet your various application needs. From conference rooms to theaters, live-event broadcasts to reality TV show production, e-sports to lecture capture, they have got you covered! Need NDI®? 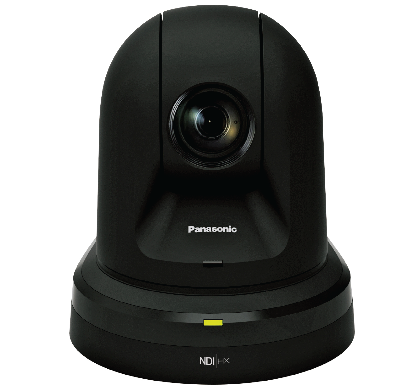 Select existing Panasonic cameras can now be upgraded to be NDI® capable and we've added an entire lineup of 'N Series' PTZ cameras with NDI®|HX. 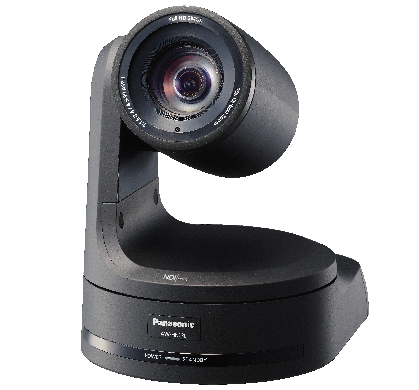 Harness the power of NDI® with Panasonic's lineup of professional PTZ cameras. 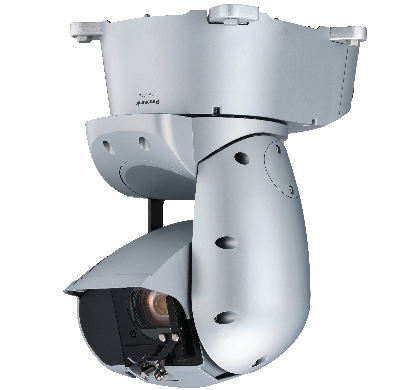 Our N Series model cameras now have built-in support for NDI® via a highly efficient NDI®|HX mode, requiring no external conversion of any kind. Audio Input: Select cameras feature a TRS-mini stereo audio input for embedding audio into the NDI® feed. 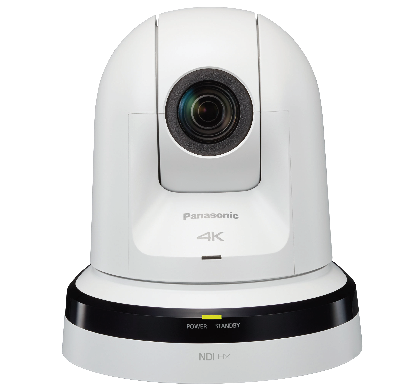 Using an IP browser, such as Chrome or Safari, you're able to fully control the PTZ operations from the control room or even from a remote location. IP control with image monitoring via PC, MAC and mobile terminals simplifies the management of cameras around a campus, or across a worldwide enterprise network. 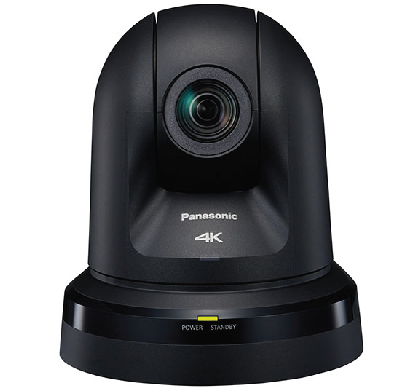 IP video monitoring and remote camera control can also be performed from mobile devices such as an iPhone, iPad or an Android device. 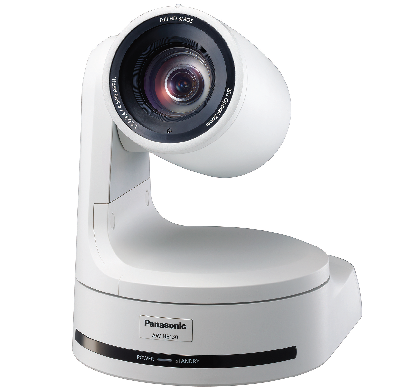 The beauty of Panasonic PRO PTZ cameras are the various options available for controlling the cameras. Since the cameras are prevalent across a wide variety of industries, we've been able to develop camera control across a number of platforms. You're not tied down to using a specific controller and we have a selection of controllers to pick from across a wide range of budgets and single / multi-camera workflow needs. 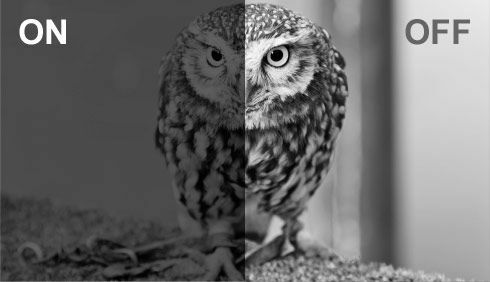 Night Mode makes it possible to shoot in extremely low light, or even in complete darkness, with the use of an ordinary IR illuminator (800nm range). Remote control and auto mode switching are provided, for use in staging, reality show production, and other applications. 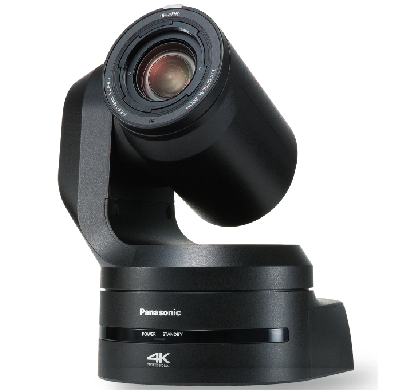 Mount the AW-HE40, AW-HE130 or the AW-UE70 to the optional AW-HEA10 remote control module to enable enhanced PTZ camera control via your tablet. 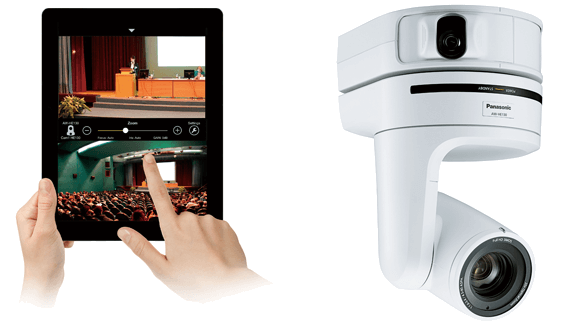 The innovative HEA10 sends a super-wide-angle video image to your tablet screen, letting you tap the desired area you want to capture and facilitates quick and smooth movement of the PTZ camera to capture the selected shot. Remote camera operation is thus significantly simplified and accelerated by allowing instant selection of a new shooting angle, eliminating the need to manually zoom out and reposition the camera. Zooming can be controlled via the familiar "pinching" motion, or via an on-screen control. Up to nine pre-set main-camera shots can also be selected via dedicated onscreen buttons. 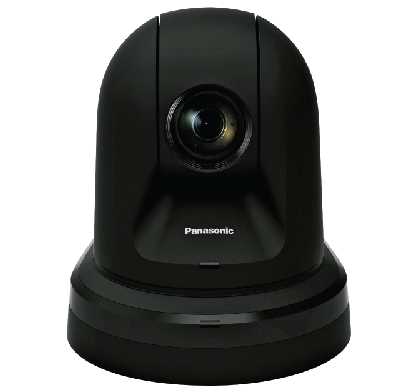 Because the primary camera (HE40/HE130/UE70) can be controlled using the HEA10's wide-angle view as a reference, the PTZ camera can be operated even when selecting a shot that can't be viewed in the primary camera's frame. Camera video and audio can be recorded in MP4 format on a MicroSD card inserted into the unit. In addition, using an IP network, it is possible to externally control recording start/stop and download the recorded files. Only available with the AW-HE40/AW-UE70. NDI®: Network Device Interface, a technology of NewTek, Inc. All specifications, availability, and pricing are subject to change without notice.